Discovered by the Galactic Republic during the Great Galactic War, Quesh’s toxic atmosphere made the planet uninhabitable for many lifeforms, and was initially dismissed by the Republic. 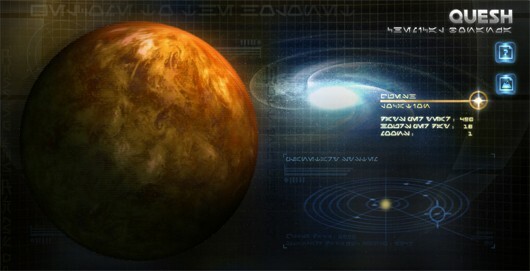 Years later, however, a young Republic chemist realized potential for some of the chemicals found on Quesh to be used for the Republic, as many of the compounds on the planet closely resembled venenit shadaaga, roughly translated as “Hutt Venom”, a primary ingredient in very powerful adrenals. After this discovery was made, it was swiftly reoccupied by the Republic who began to invest in its production. However, the Republic engineers were unable to master the process of turning these chemicals into adrenals, so they resorted to an unlikely ally, the Hutts. Three Hutt cartels lended their help in the exchange for a share of the profits. Within a decade, the Republic was fully invested in Quesh’s adrenal industry. Despite efforts to keep Quesh a secret, the Sith Empire eventually became aware of the Republic’s operation, and its Hutt allies. Branding the three Republic-aligned cartels as traitorous, the Hutts were forced to aid the Empire in an effort to take control of the planet from the Republic. 58 – [Cunning +4] X425; Y:140 First, enter the Republic Mining Camp and make a right after the area with water. You will then see a set of pipes. Jump onto the pipes then onto the wall above and the area off to the right. Then follow the metal fence to the right. Go all the way down and when you hit the grass area go left and you will see that the fence is broken. Go through and make a left. As soon as possible make the next right and go under the structure above. Go left around the next structure ahead of you and you will find the Datacron. 59 – [Endurance +4] X:207 Y:775 – REQUIRES 2 PEOPLE – First, enter the Yuna Crosscut entrance at (-9, 715). Follow the cave all the way down until you reach an opener doorway with a panel. Go inside the doorway and turn your camera, so that you can activate the panel from the inside. The door will close and gas will activate. Just be sure to have a healing companion with you or use healing abilities yourself if you have them. Close by you should see two pillars with activation consoles on them. Activate the one closest to the entrance you just came from first. After activating both panels you can enter the newly opened door to the south. The Datacron is at the end of the tunnel. 60 – [Strength +4] X:207 Y:77 South of the Three Families War Camp, on the south-side of the big hill. There’s a small path between 2 baracade walls to get up to it.